This building is situated in the south-western corner of St Isaac’s Square. It looks like an ancient temple. The Manage was built after the design of Giacomo Quarenghi between 1804 and 1807 for the famous Horse Guard Regiment. The Manège was built in the classical style. Over the entrance there is a bas-relief. The scenes of riding com­petitions in the ancient circus are depicted there. Wide stairs lead to the main entrance. They are graced with two marble sculptures of Dioscuri. The statues were made in the workshop of Paolo Triscorni between 1810 and 1811. They are miniature marble copies of the ancient statues of the Quirinal Palace in Rome. The Quirinal Palace was the residence of the Italian kings from 1870 to 1946. The Dioscuri are the heroes of ancient mythology twin brothers Pollux and Castor. Zeus sometimes descended from Olympus to enter into nuptial relations with wom­en who didn’t belong to the realm of the gods. As a result of one such visit the twins Castor and Pollux were born to Zeus and the wife of the Spartan King, Tyndareus. They were so alike that they couldn’t be distin­guished from one another. However, Castor was mortal while Pollux inherited immortality from his father. Both of them were excellent horsemen and brave warriors. They loved each other and were inseparable. When Castor was killed in a battle Pollux felt so lonely, that he begged Zeus to allow him to die. Zeus permitted Pollux to share his immortality with his twin brother. By decision of the ruler of the gods, the brothers again became inseparable. Zeus ordered that they would spend one day on Olympus among the immortal gods and the next day among the shades of the dead in the under­world. In Sparta the brothers Dioscuri were treated as defenders of the Motherland and Patrons of gymnas­tics. Close to the Manège at the beginning of a boulevard there are two columns crowned with figures of Glory. They were placed here between 1845 and 1846. These statues were cast in Berlin from a model by the sculptor Christian Daniel Rauch and presented by the Prussian King to Nicholas I. The sculptures of the goddesses of Glory hold laurel wreaths. 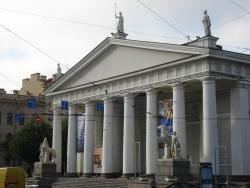 The columns are made of polished granite from the town of Serdobol. These col­umns commemorate the feats of the Horse Guards Reg­iment in battle during the war against Napoleon. Nowadays, the Manège building houses the exhi­bition hall of the Union of Artists. The wonderful art exhibitions are organized regularly in this building. This building is one of the best architectural monu­ments of St Petersburg.